Owners of both hunting and domestic dogs should be aware of other lawful uses in the areas where they enjoy the outdoors - including regulated trapping during legal trapping seasons. Trapping is a highly regulated activity in Oregon. Oregon regulations are designed to ensure humane treatment or furbearers and other animals and make it illegal to use certain traps. Traps set for some animals such as otters, raccoons, and lynx, can also catch dogs. Following are some tips and information that will help prevent your dog from inadvertently being caught in a trap. It is unlawful to disturb or remove the traps of any licensed trapper while the trapper is trapping on public lands in season. If you believe a trap has been illegally set, contact the Oregon State Police. Keep your dog in close contact at all times, and carry tools like wire cutters. In areas of trapping activity keep your dog on a leash. If not on a leash, control your dog as best as is possible. Be aware of where and when trapping activity can occur. Most trapping occurs in the winter because pelts are more valuable at that time. Limited trapping also occurs during the spring and summer. Trapping is allowed on most public lands. Regulated trappers are not required to post signs, so always be aware. Many of the traps in the area are what is called a Conibear Trap. The traps have springs on either side of "jaws." Squeeze both springs and twist the trap so the jaws are not placing pressure on the animal's windpipe. Squeeze together one of the springs using both hands until you are able to fasten the safety lock of the arms of the spring. Repeat the process on the other spring and slide the animal's head out of from between the jaws. For detailed information, go to: http://dnr.wi.gov/org/land/wildlife/TRAP/bodygripbrochure.pdf. 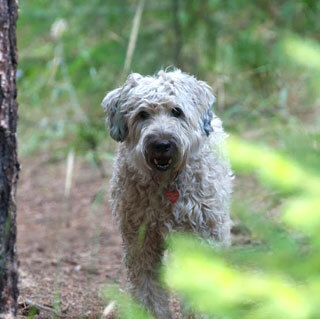 The last thing Jack Williamson expected while he and wife Jill were walking their beloved Wheaton terrier, Kieri, along the Metolius River trail near the Wizard Falls fish hatchery on Saturday, February 11, was that Kieri would soon be fighting for her life. "While watching birds along the Metolius River, Kieri became ensnared in a trap used to take river otter," Williamson said. "The trap was set only 18 inches off the trail, and it would not have changed a thing if she had been on a leash." Much to the surprise of the Williamsons, otter traps are perfectly legal to be set in the area along the trails of the Metolius from November 15-March 15. The Oregon Department of Fish and Wildlife (ODFW) has very few if any regulations stipulating how far from public roads, paths, and trails traps can be set. There is also no requirement to post traps, and it is illegal to disturb a trap. Currently in the state of Oregon, there is no penalty for trapping a pet, even if it is killed. Oregon does not keep statistics on what non-targeted animals are caught by these traps, but incidences of dogs being caught, injured, and in some cases killed along popular recreational trails have increased in recent years. "I believe that if you selected 100 people at random and then walked them one-by-one by the bush where Kieri was ensnared, and then turned them around and told them that a quick-kill animal trap was just inches off the side of the maintained trail they just walked down, not one person would think that was OK, most would be outraged," said Williamson. The trap used to ensnare Kieri was a Conibear Trap, or otherwise known by its Oregon ID as a "280." It has up to an eight-inch jaw spread and is completely legal to use on dry land in Oregon. The trap closes with about 90 pounds of pressure and is nearly impossible to open without knowledge of how the trap operates. Designed to kill otter, beaver, bobcats and lynx instantly, a domesticated animal who survives the initial, crushing, closure of the trap has very little chance of survival unless removed immediately. "Kieri was strangled. She was unconscious for at least five minutes, probably longer, while I struggled unsuccessfully to release her from the trap," said Williamson. "Thankfully Jill had enough sense to run for help. By the time ODFW employee Mark Dean arrived, I had given up. Gratefully, Mark did not hesitate, he called me back to help and between the two of us we were barely able to summon enough strength to slip the trap off her neck." "I'm not very familiar with those things either, but I had seen them and was able to remember how to get the pressure off," Dean said. After Kieri was removed from the trap, Williamson laid down beside her and heard a faint heartbeat. "I gave Kieri mouth to nose breathing for the better part of a minute, and eventually she began to breathe on her own," said Williamson. Once removed from the trap, the Williamson's took Kieri to Companion Animal Emergency and Critical Care in Bend. "When Kieri came in, X-rays showed some fluid in her lungs," said Debbie Putnam, DVM at the clinic. "We treated her for 24 hours andshe was released. She is a very lucky dog." In addition to Kieri, Putnam treated another dog for trap related injuries, and the clinic has treated a total of seven dogs recently that were caught in traps. Oregon has a long history of trapping, and wildlife managers in many states will demonstrate that trapping benefits both people and wildlife. In the early 1900s otter nearly disappeared due to a substantial loss of habitat and 200 years of unregulated trapping and hunting. Thanks to a partnership between trappers and wildlife biologists, nearly 4,000 otters have been released back into the wild in 18 states, after being trapped in places where they are abundant, like Louisiana and Maryland. Trapping can help restore threatened and endangered species by controlling predators and other animals that would otherwise have killed these sensitive animals or destroyed their habitats. All traps in Oregon are marked with the owner's license number assigned by ODFW. It is unlawful to disturb traps during the season in which they are used and they only have to be inspected every 48 hours for removal of any trapped animal. ODFW has information at their website entitled "What dog-owners should know about legal trapping in Oregon" at http://www.dfw.state.or.us/wildlife/docs/dogs_and_trapping.pdf. Regardless of the legalities, a dog encounter with a trap can be traumatic and deadly. "The horror of watching your pet struggle to free itself from the grasp of a heavy trap around it's neck is almost too much to talk about," Williamson said. "But, Kieri is now home with us and she is expected to make a full recovery." For more information on hunting and trapping in Oregon, visit the ODFW website at: http://www.dfw.state.or.us/resources/hunting/small_game/. "Trapping is a highly regulated activity in Oregon." And they say that with such a straight face. This comment has been hidden due to low approval. Like so many other dog owners, I was completely unaware that traps could be legally set as close as 18 inches off a busy trail such as Metolius, where children and pets could easily be injured or even killed - which surely would have happened to poor Kieri were it not for the fast, intelligent actions of her owners, and the complete luck of them finding a knowledgable ODFW employee nearby. Surely there must be a way for everyone to do their own thing on public land. Would it be so hard to slightly alter the extremely generous regulations given to trappers and require that they set their traps at least 50 feet off any designated trail? Does anyone know how to go about seeking such a change so we can all stay out of each other's way? This comment has been hidden due to low approval. Current laws are clearly on the side of the "furtakers". Traps are basically concealed weapons placed in public venues and protected by law. AND trappers legally take our public resources for their personal profit. Pelts from animals trapped here are sold to markets as far away as China yet trappers have no responsibility for any injury or accident that their hidden devices cause. There are only unenforceable "regulations" regarding how often a trap is checked. The method in which a trapped animal is dispatched is solely up to the mood of the trapper and ranges from gunshot to clubbing to suffocation. There is no legal recourse for prosecuting a trapper when he or she injures or kills a pet, endangered species or any other non-target animal. There are however fines and jail sentences for anyone "tampering" with a trap. If public lands are truly public why does a trapping minority enjoy this legal protection? The huge majority of those who use public lands prefer seeing wildlife as the name implies: wild and alive. There is a growing movement among recreationists to demand that, at the very least, traps are clearly marked so they can be safely avoided. At best, Oregonians would finally understand trapping for what it is: a cruel, archaic and unnecessary blood sport, which has no place in a humane and civilized society. Chief Seattle once said " How can you own the sky, the earth, the animals - the earth does not belong to us, we belong to the earth." How come we grew so arrogant to believe we have a right to inflict suffering on animals for the sheer "sport" of it, or for making a profit of their skin, throwing their bodies away. 88 countries in the world have banned trapping, and 8 states within the US. Saying that it is beneficial to "control" wildlife is a coward statement to mask the fact that those in charge take a profit from keeping trapping legal and that those in charge do not have the ethics, morals and sensitivity to realize that animals are sentient beings with feelings and a soul. Trapping is cruel and unnecessary infliction of pain to innocent animals and must be outlawed if we claim that we are evolving as a human race.